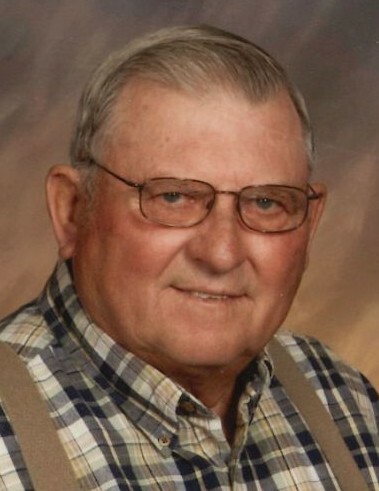 Raymon Edmond Hoover, 81, Twelve Mile, Indiana, passed away at 7:35 a.m. on Monday, March 25, 2019, at his residence. Born September 19, 1937, in Twelve Mile, Indiana, he was the son of Orval Wayne and Alma Lavonne Snell Hoover. On November 11, 1961, in Fulton, Indiana, at the United Methodist Church, he was married to the former Karon Kay Dillman, and she survives. He was a lifelong farmer in the Twelve Mile Community, farming grain and raising hogs until his retirement in 2000. He was a graduate of Twelve Mile High School in 1956. He enlisted in the United States Air Force and served from 1956-1960. He was also a member of the former Twelve Mile United Methodist Church. Survivors include his wife, Karon Kay Hoover, Twelve Mile; two sons, Doug (Mel) Hoover, Kewanna; Darryl (Val) Hoover, Twelve Mile; six grandchildren, Kegan (Tori) Hoover, Indianapolis; Monica (Carl) Davis, Metea; Kendall (Chris) Meyer, Boston; Trevor Hoover, Carmel; Haley Hoover, Ft. Wayne; and Hanna Hoover, Ft. Wayne; two step-grandchildren, Adam (Ashly) Berry, Logansport; and Hali Berry (Allen Ingram), Westfield; three great-grandchildren, Ben Hoover, Addison Davis, and Rosalie Hoover; and three step-great grandchildren, Gigi, Rowan, and Lynnly Berry; one sister, Rosalee Ratliff, Lizton; two sisters-in-law, Barbara Hoover, Wisconsin; and Mary Hoover, Plymouth; and several nieces and nephews. He was preceded in death by his parents, two brothers, Sam Hoover and Ross Alan Hoover; and one sister-in-law, Roberta Hoover. Funeral services will be held at 10:30 a.m. on Thursday, March 28, 2019, at McClain Funeral Home, Denver, Indiana, with Pastor Roger Knebel officiating. Burial will follow in Greenlawn Cemetery, Mexico, Indiana, with military rites. Visitation will be from 4-8:00 p.m. on Wednesday, at the funeral home. In lieu of flowers, memorial contributions may be made to the Twelve Mile Community Building Fund c/o Community State Bank, PO Box 101, Twelve Mile, Indiana 46988. The online guestbook can be signed at www.mcclainfh.com.